MRIS released its report on January sales of existing homes and condos [those listed or sold by real estate agents] in the District on February 11. It isn't an auspicious beginning to the year. The data continue to show that condos and single family homes are selling for higher prices despite collapsing sales volumes. I think the high end market continues to distort how well the overall market is performing. Of the 318 units that sold, 34 - or 10.69% - sold for more than $1M. Lacking data granularity, it's hard to discern the dollar volume weighting of those units. However, if each sold for only $1M they'd represent almost 20% of the month's dollar volume. Sales volume. Overall, down 37.03%. 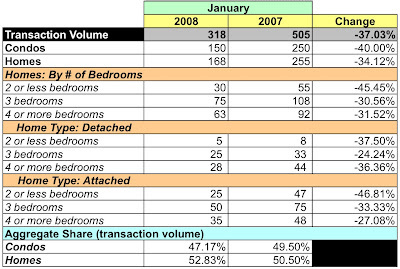 YoY, condo and home sales volume dropped through the floor, down 40% and 34.12% respectively. Sales volume was negative across the board. Condos represented less than half of the units sold, 47.17%. Dollar volume. In aggregate, down 29.81%. YoY, condos were down almost 31.16% while homes were down 29.03%. Dollar volume was negative for every category of housing. It really became "which did worse?" The "best" [least worst] performance was -19.07% for attached homes with 4+ bedrooms. Average sales price. Overall, up 11.46% YoY. 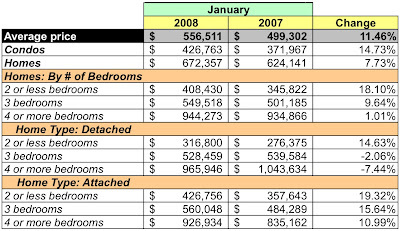 Condos rose 14.73% to $426,763 while homes increased 7.73% YoY to $672,357. Days on market. DOM was 87 days. A closer look shows that half of all homes sold within 60 days. Ominously, DOM has steadily increased since August 2007, from 59 days then to 62 [October] to 68 [November] to 80 [December] and now 87. Inventory. Based on the month's transaction rates and active listings, there is a 9.5 month supply of condos, a huge 60% increase from December, while home inventories are at 9.14 month's supply, a whopping 41.54% increase from December. Essentially, January continues a downward trend that began in July. However, it seems that it's gathering steam on its way down. So isn't MRIS going to reset DOM after the house goes off matrix for 90 days versus 180 days. Isn't this just a tactic to manipulate the data people are looking at? Would love thoughts in a post!